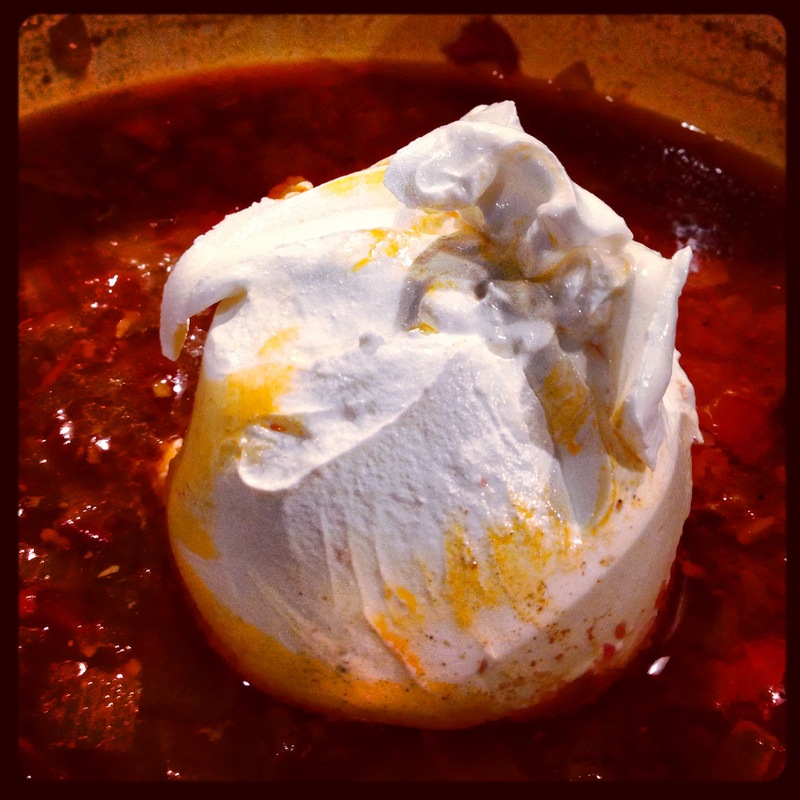 So, this is my first crack at “real” Hungarian cooking. As I posted a while back, I’m using (what I believe to be) an authentic Hungarian cookbook and pairing that with my own memories of dishes I grew up with to try to recreate some of my favorite Hungarian meals. 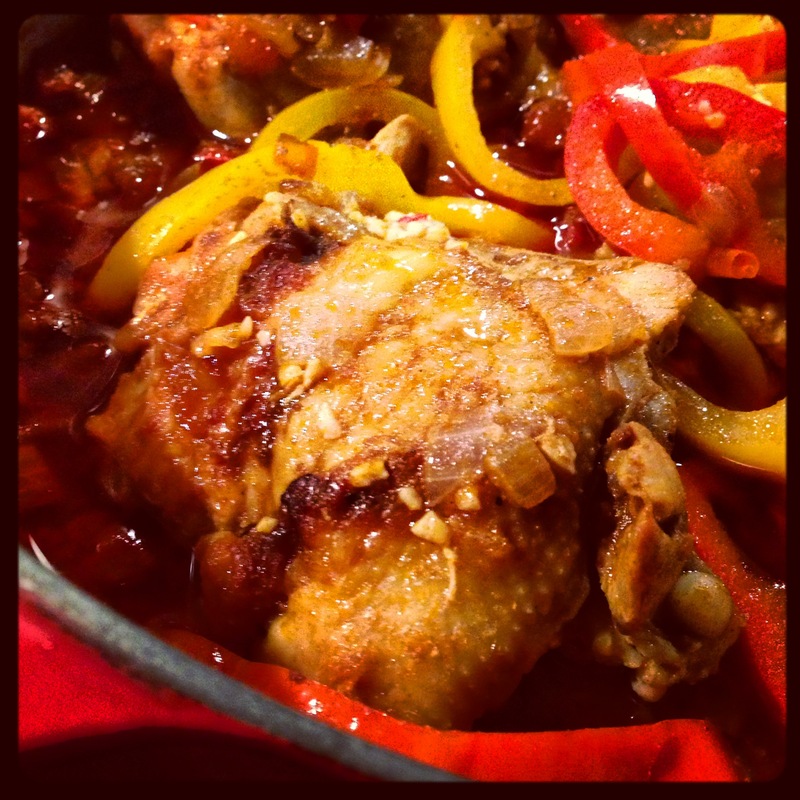 Chicken Paprikas is a staple Hungarian dish. A fairly small number of ingredients come together to create a deep, rich flavor, and the process is relatively easy as well. Since it would be plagiarism (and rather boring) to simply make and post the recipes out of my book, I made some tweaks to the basic recipe. I was quite pleased with the results, and I think the flavors came together very nicely. 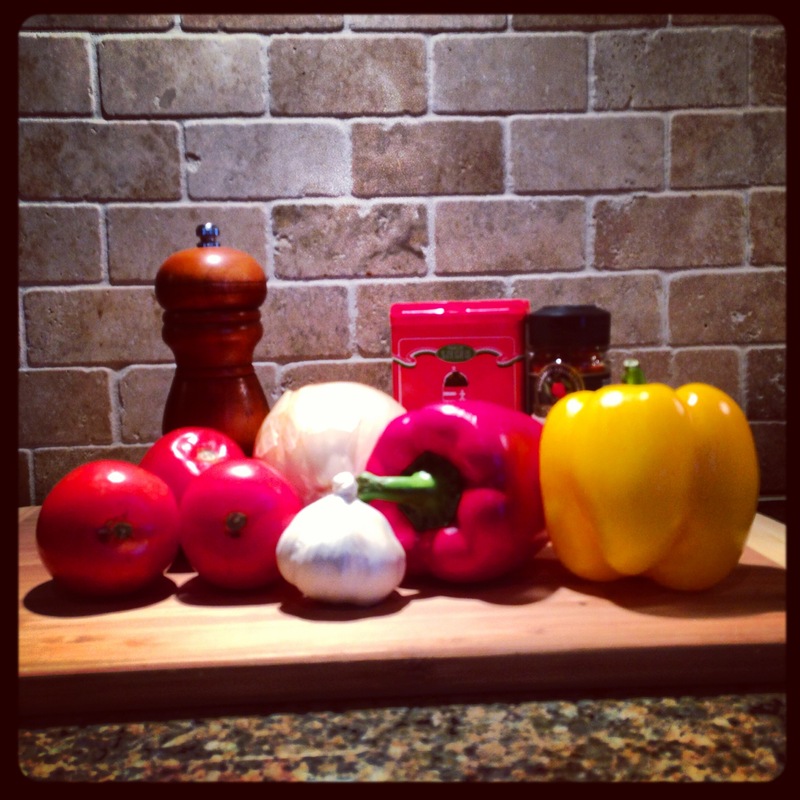 Start by prepping all of your vegetables so you have everything ready to go as you start cooking. While you are slicing and chopping, preheat your oven to 375 degrees. Mince the garlic cloves, and set aside for later. 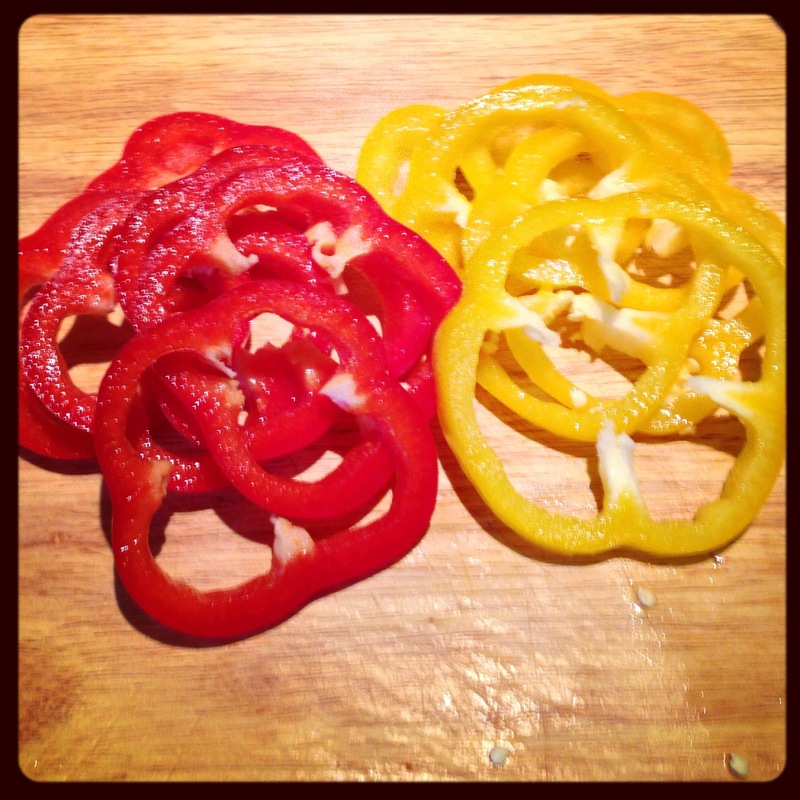 Next, slice your bell peppers into thin rings and set aside as well. 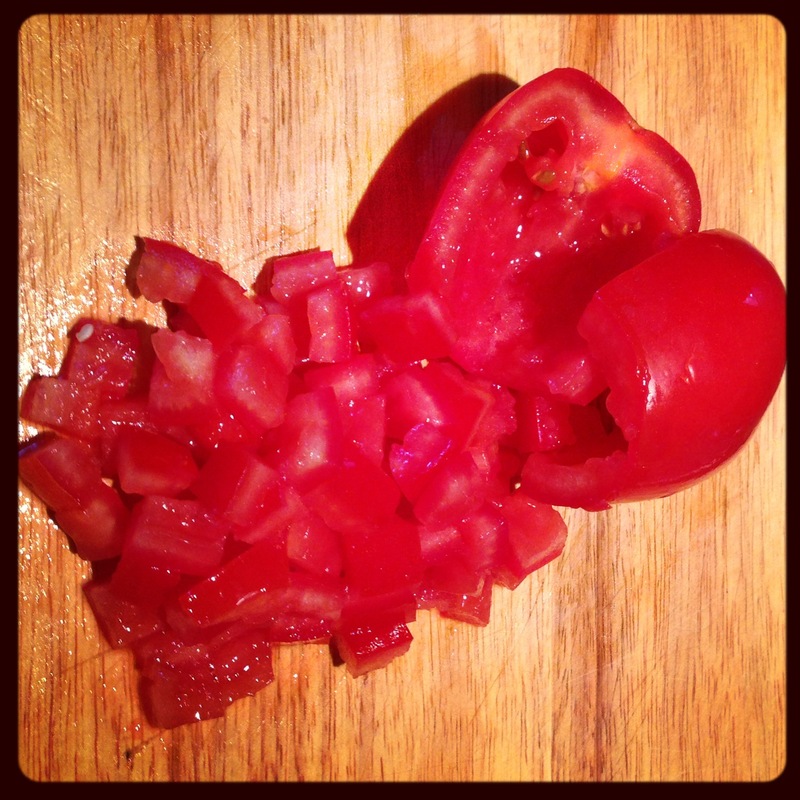 Next, slice the tomatoes in half, remove the seeds and chop. 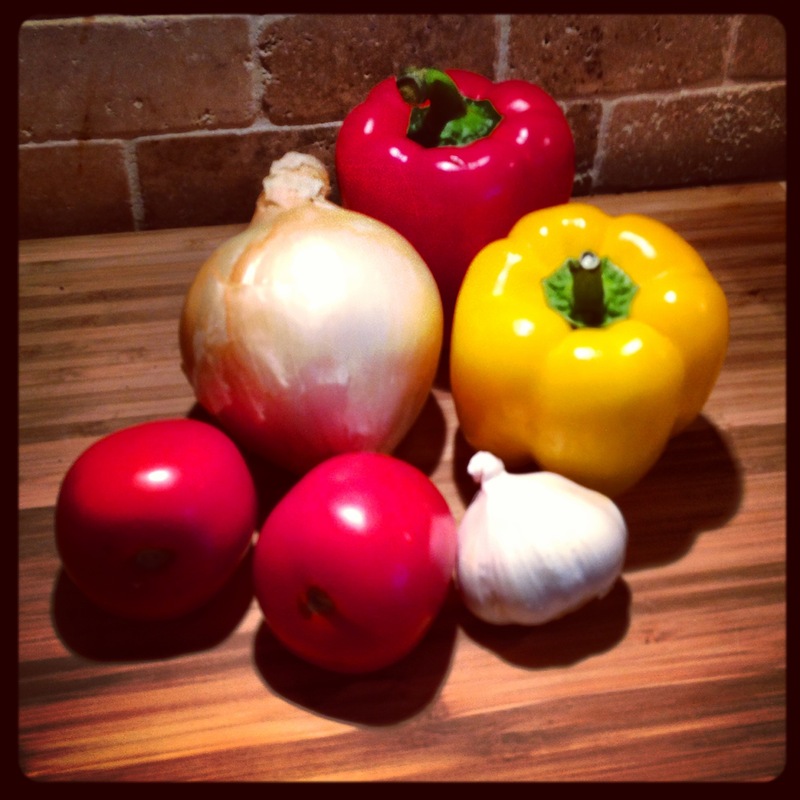 Set aside with the tomatoes and garlic. Finely chop your onion. 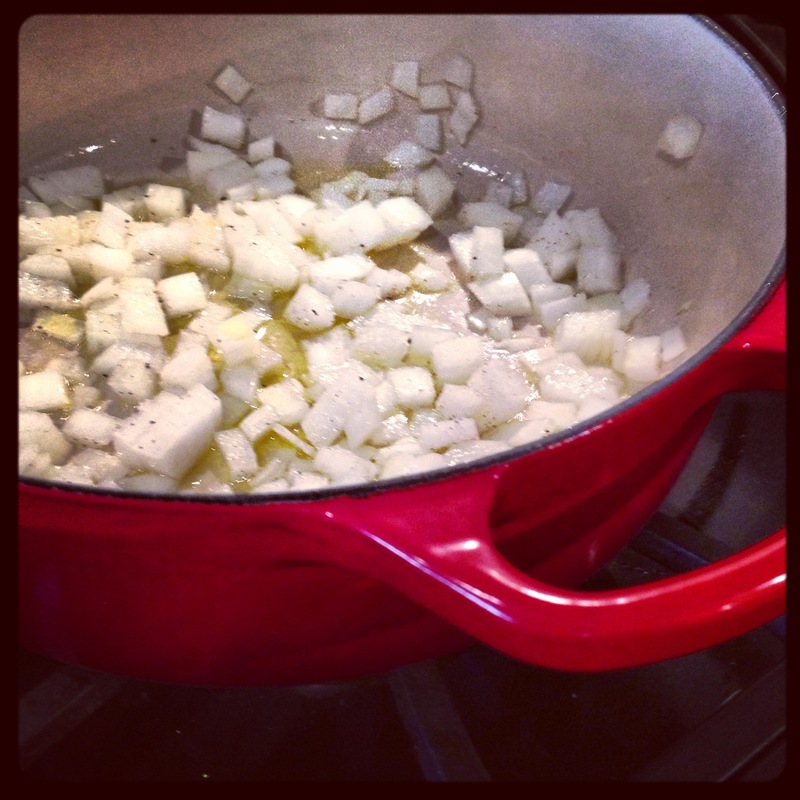 Heat some olive oil in a heavy, oven-safe pot or dutch oven and start to cook the onion. 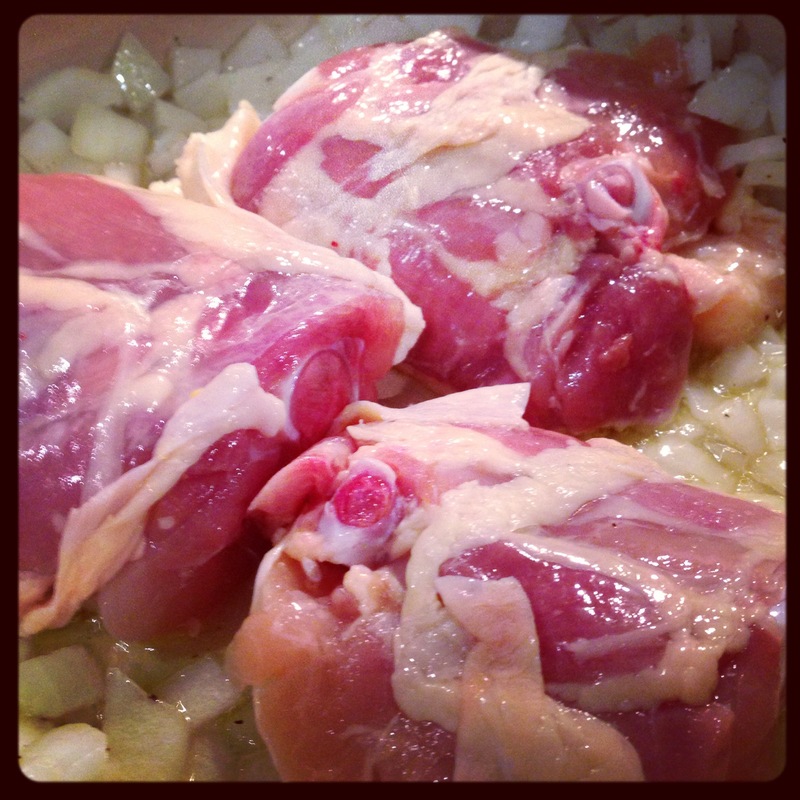 Once the onion starts to soften and become translucent, add the chicken, skin side down. Cook over medium-high heat for several minutes to brown the skin. Then flip the chicken skin side up. Add the tomatoes, garlic, sweet paprika and smoked paprika to the pan. Stir gently to combine. 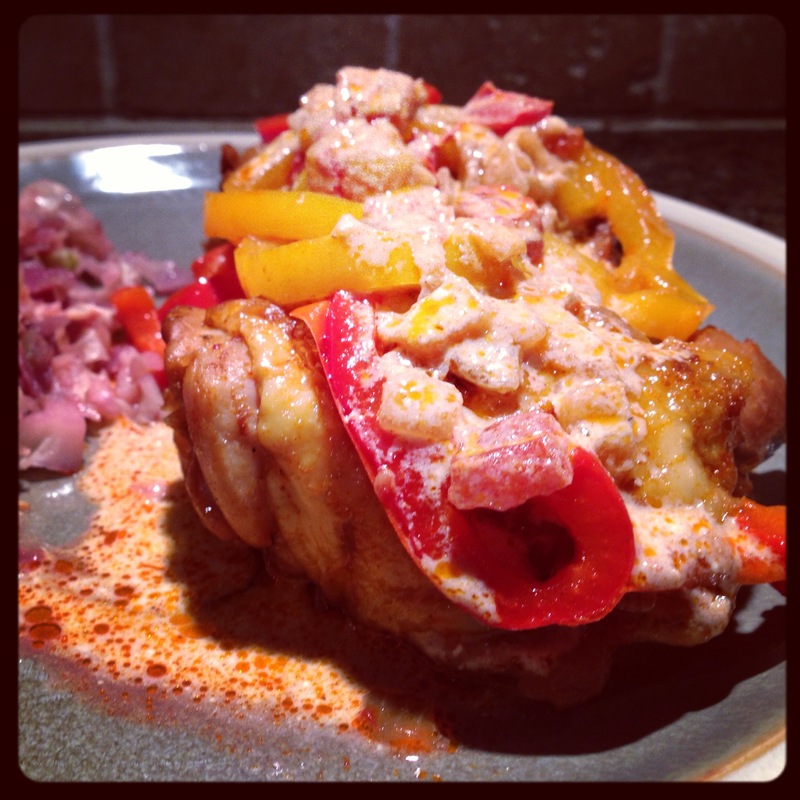 Lay the bell pepper slices over the top of the chicken. Cover and place in the oven. Bake for at least 30 minutes. There should be more than enough liquid present from the vegetables and the oils coming out of the chicken skin, so you should not need to add any fluid to the pan prior to placing in the oven. 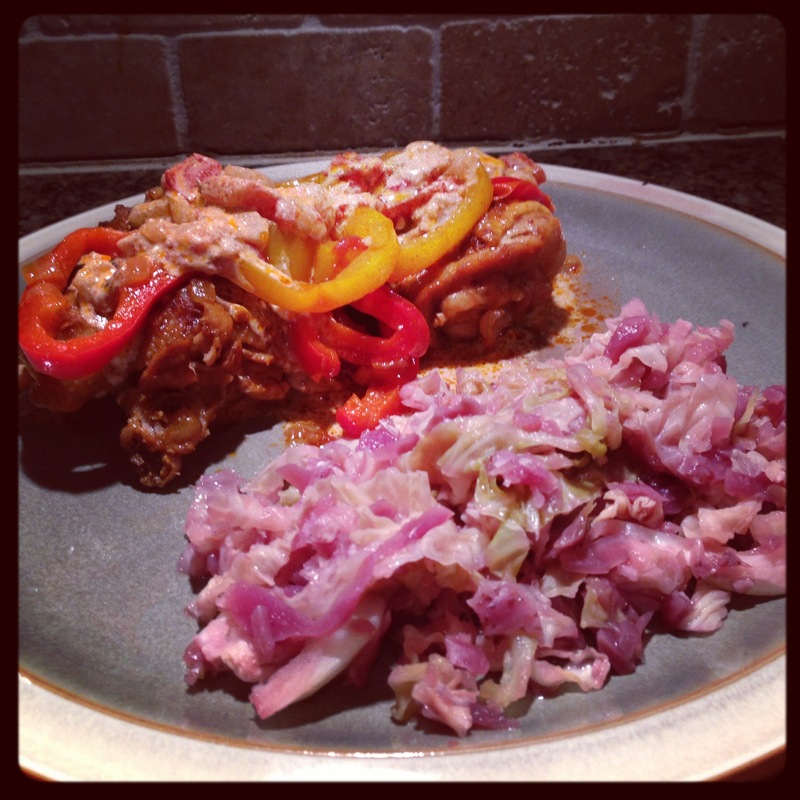 While paprika magic is occurring in the oven, you can make this simple cabbage dish to go with it. This is not authentic Hungarian food. It’s not really authentic anything since I pretty much just made it up today, but it tasted good, so here it is. 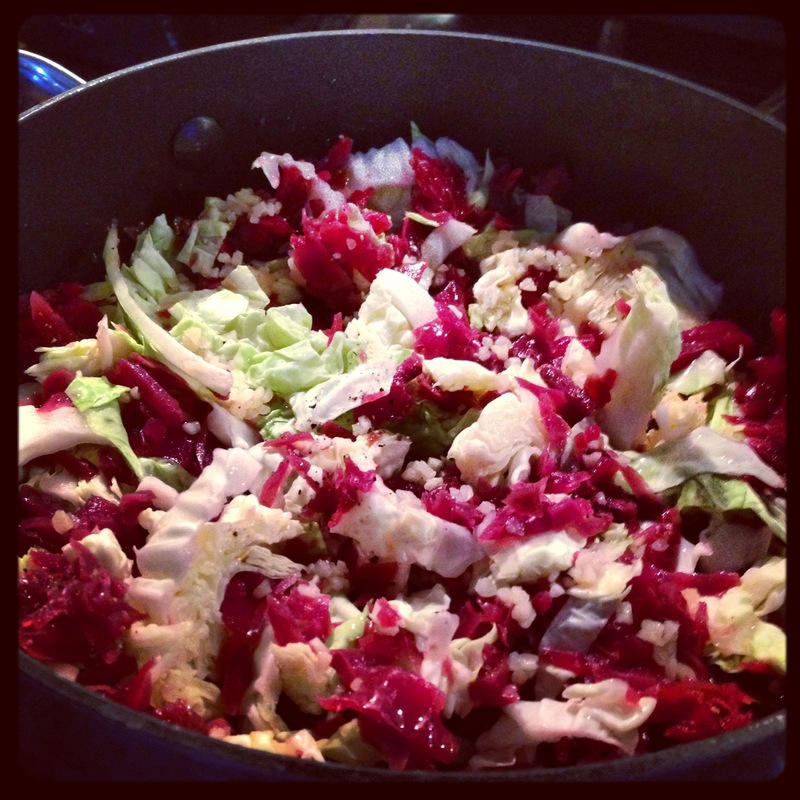 Place the shredded cabbage, the prepared red cabbage, the minced garlic and the chicken stock into a pot. Gently stir to combine. 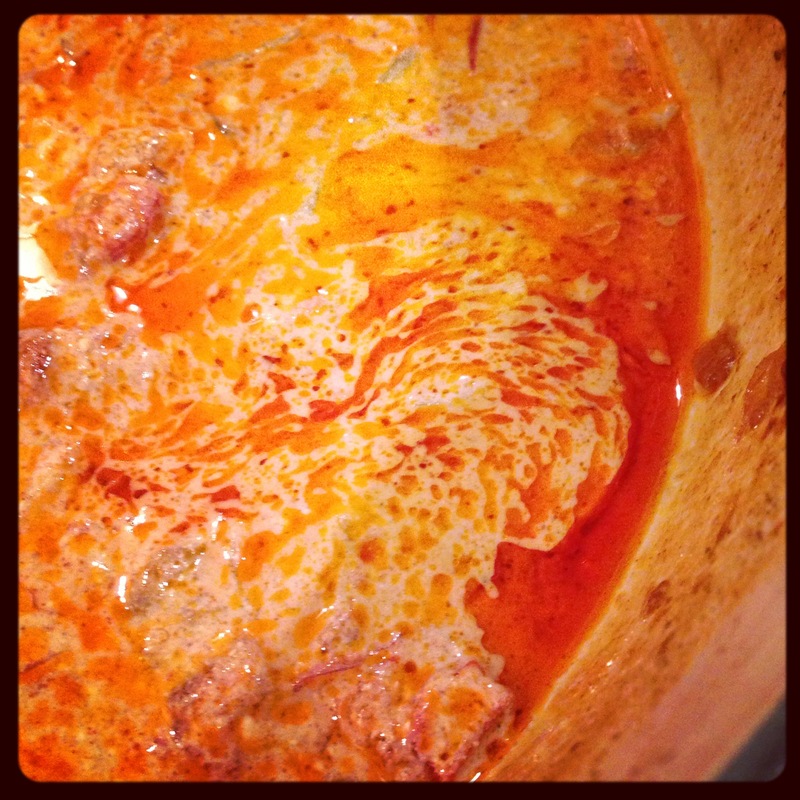 Cover and simmer for at least 15 minutes. How long you cook it depends on your taste. 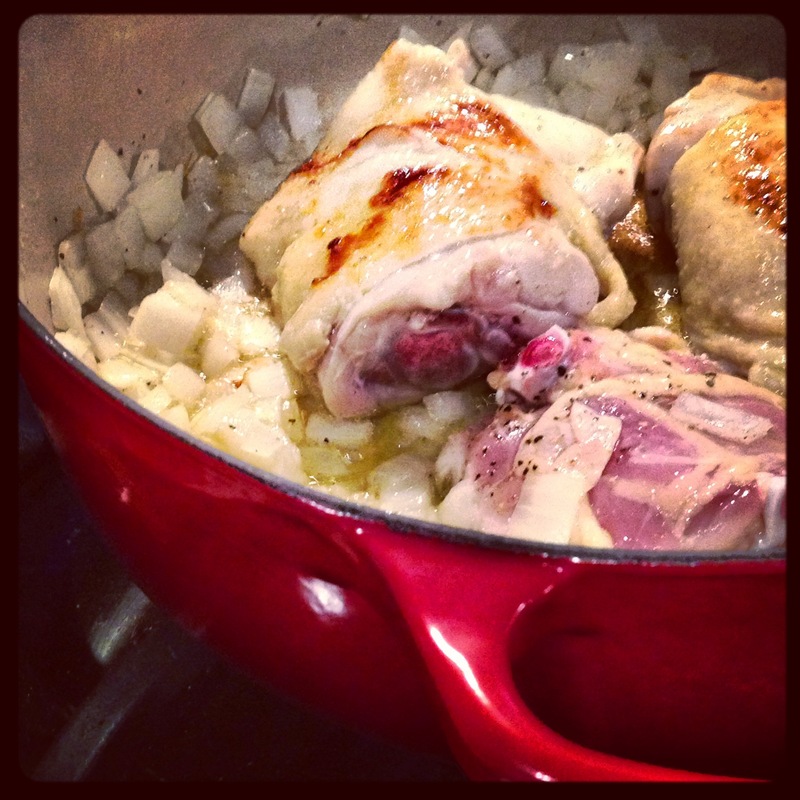 If you want it a little crisper, simmer for a short time. If you like it soft, simmer longer. 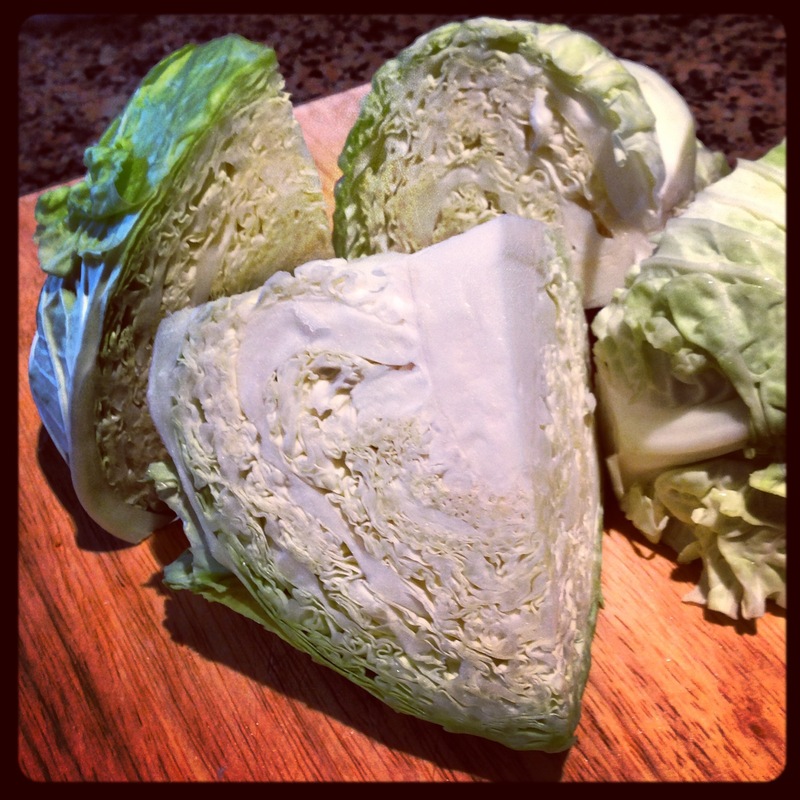 Just be careful not to overcook it since the savoy cabbage is intended to bring a freshness to the red cabbage. Once the chicken is done, pull it out of the oven. Uncover, enjoy the aroma and marvel at the beauty inside. Okay, enough marveling. Time to finish cooking and eat! Use tongs to remove the chicken and bell pepper slices and set on a plate or cutting board. 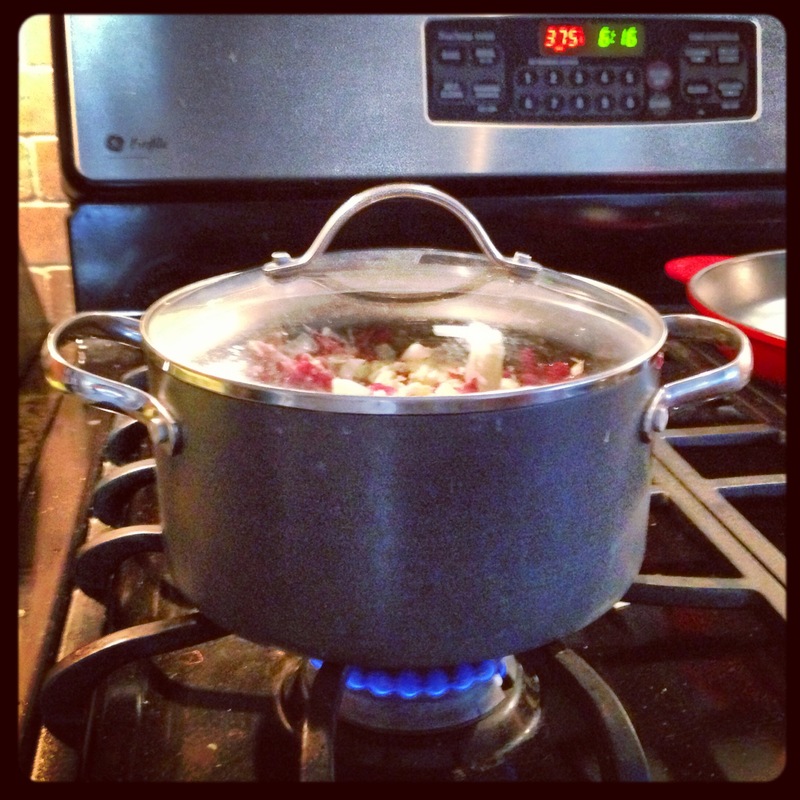 Place the pot with the juices, tomatoes and onion on your stove top. Turn a burner on low and add the sour cream. Stir gently to combine. 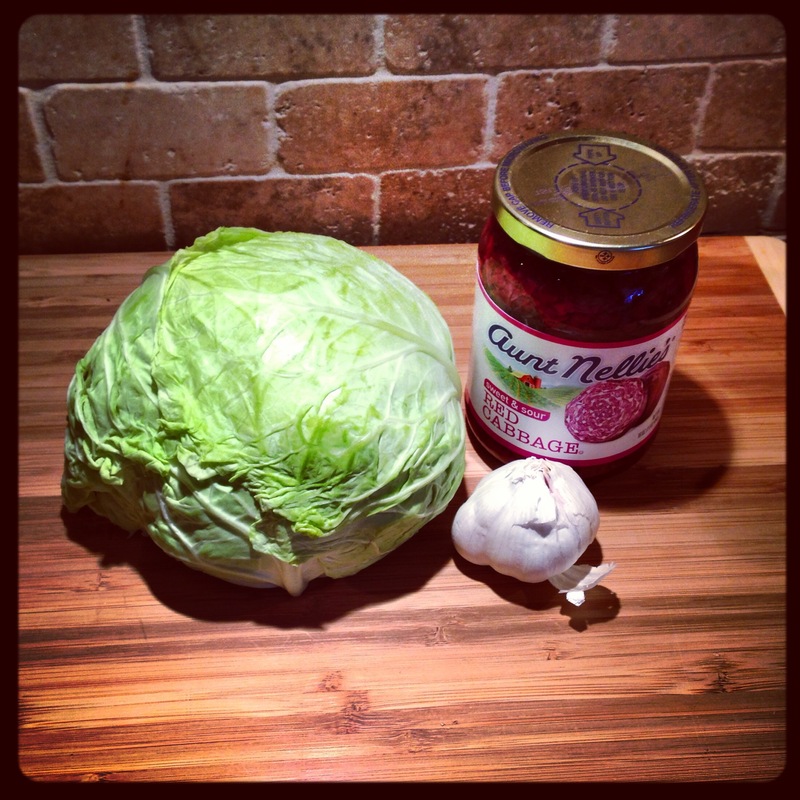 It will not (and should not) become a perfectly combined sauce. The oils and the cream will swirl together. If you like a thicker sauce, you can add a little bit flour to the sauce, but I personally prefer not to. The cabbage tastes great as it is. It also tastes great with a little parprikas sauce on it. Up to you. But, honestly, not too many things work together as well as cabbage and sour cream. So, some final thoughts. First, the smoked paprika is not particularly traditional, but it’s delicious. 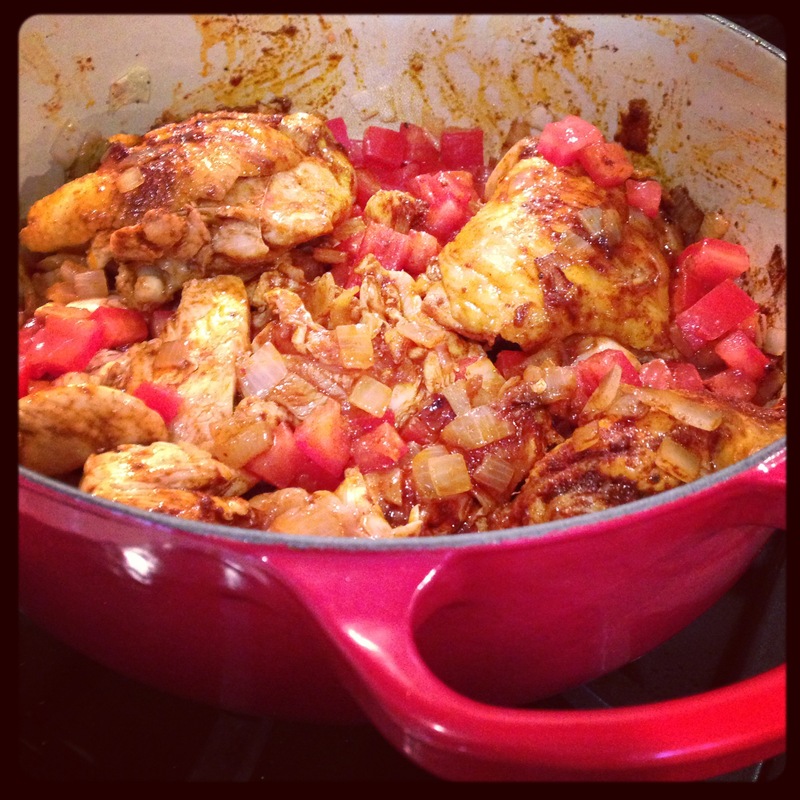 The sweet paprika is still the star here, but the smoked paprika adds a really rich smokiness to the chicken. 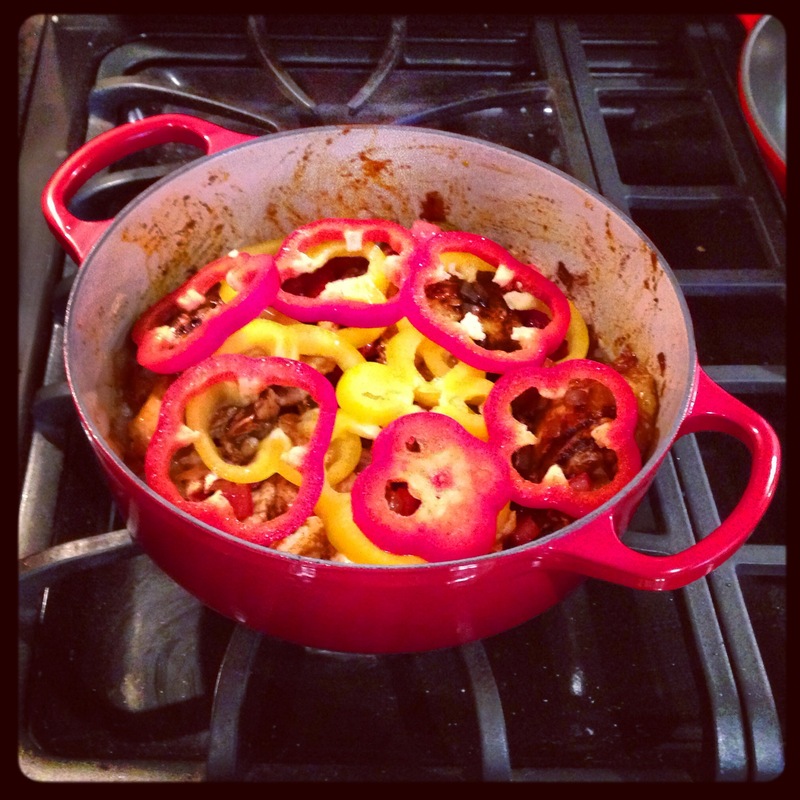 Also, this dish is traditionally made on the stovetop rather than in the oven. I chose to start and finish it on the stove, but do the bulk of the cooking in the oven because it freed me up to make the cabbage (and play with my little guy while dinner is cooking). I find using the oven is a very family-friendly way to cook since it gives me time to spend with my wife and son while food is cooking, but you could certainly simmer this low on the stove as well. And, as mentioned above, the sauce could be a little thicker. My mom’s sauce was definitely thicker. My grandfather’s sauce was probably a little thinner. You’ll find the consistency you like, just as I’m sure I will. Overall, this experiment went well.